Do you want to have fun this Tuesday night in Portland? Then come to The Whom's reading at The Corner Bar at 7:30 PM on 7/28. The Whom features some of the most entertaining and well-published writers in town, and it seems like every one of them has a new offering out right now. Rebecca Kelley's debut novel Broken Homes and Gardens just came out in May, and Heather Arndt Anderson's second foodie offering, Portland: A Food Biography, was released to accolades earlier this year. Finally, writer/humorist/all-around PDX baller Mark Russell saw his first of a series of DC-released comics come out last month. Pretty ridiculous, yo. The readings themselves will be short, engaging, and the perfect accompaniment to your $2 BEER! In fact, should you come, you will be the first audience in the History of Man to hear the prologue for my Novel IV, which is called 19 Ways to Destroy Your Rock Band: My Life in the Convincing Fakes. I assure you I am not. I have decided to turn my memoir-in-progress Nineteen Ways to Destroy Your Rock Band: My Life in the Refreshments into a novel. There are exactly ten reasons for this change. Despite a few hundred folks within my circle, there is not much demand for a Refreshments memoir. I know this because I have tried to sell it. Many in the industry love the idea for my memoir outside the Refreshments aspect, which they don't care for because we weren't the Beatles. Solution? Take the Refreshments out. The finished, polished memoir is all of 48k. This is too small. The process of fictionalizing it has freed me up to explore ideas I would avoid if it were a memoir, which means I can get this thing to 60k, which is where it needs to be. No more novellas ever. I'm very intrigued by the recent-ish trend in fiction to write more or less straight memoir a la Knausgaard, Tao Lin, David Shields, etc. as novel. I call this Barely Fiction. It used to be you'd write fiction to embellish an idea. Now, many write fiction when they want to tell the truth. This is complicated, but it excites me as a writer. This means I can have a novel finished by next year! It also means I can give One Star--what would become my fifth novel--the time necessary to make it wham-o. I've always had a problem with being a little ahead of the curve when it comes to, ahem, market readiness. I released Stuck Outside of Phoenix, set in 1990, in 2003. My second, Ghost Notes, set in 1995, was released in 2008. 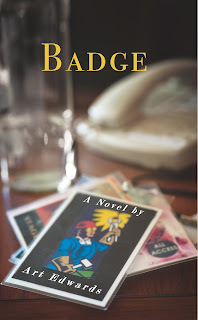 My third, Badge, set in 2000, came out in 2014. That's really too soon on all three accounts for enough people to feel nostalgia for these eras. This change would put my Barely Fiction effort, set 1993-1998, out in 2017-18, and would have One Star, set in 2005, out in the 2020s. This all makes more sense to me. Everyone reads my novels like they're memoirs anyway! It allows me to skip the baggage of having to write about real people, giving me just enough cover to make the book more interesting. Did I already mention that no one wants to publish the memoir? I'll take truth over fact any day. As we patiently wait for Netflix and Satan (Amazon) to add Stuck Outside of Phoenix the Movie, I thought I'd string together a blog or three about what I'm writing these days. First, I'm very close to finishing the screenplay version of Ghost Notes, which is now called Flake. I've been working on this off and on for years, and I finally feel like it's ready. I'll be putting the finishing touches on it in the next week, and sending it out to the folks who might be able to do something with it. If you're curious, the way forward is to read Ghost Notes, my second novel in the great chain of novels that will become ten. Also, I'm taking a chapter a week of my novel-in-progress One Star into my writers' group The Whom. (We changed our name to The Whom on a whim, and no one bothered to protest. Incidentally, The Whom members Rebecca Kelley and Heather Arndt-Anderson both have had books come out in the last few weeks. This group gets it done, and it's all good.) One Star brings back Hote from Stuck Outside of Phoenix as he navigates the world of tribute bands in 2005. Don't expect this anytime soon, but know it's coming. I have a five-book omnibus review on 2014 rock novels coming out soon at The Rumpus, and I also wrote a 6,000 word essay on my youth and R.E.M. that has got to find a home somewhere. I'll keep you posted. Finally, I haven't mentioned my memoir Nineteen Ways to Destroy Your Rock Band: My Life in the Refreshments. Its plight is a bit of a longer story, so I'm going to write up that blog next week for you. Stuck Outside of Phoenix the Movie Gets Distro!!! I just heard from Producer Nico that the movie version of my first novel Stuck Outside of Phoenix has been picked up for distribution. This is fantastic news because it means you all will be able to see the movie soon. I don't have the full scoop yet, but here's what I know. 1) It's a done deal. 2) It will be available through online portals like Amazon and Vimeo. Big thanks to Nico Holthaus for bringing this one home. Watch the Movie Trailer for Stuck Outside of Phoenix. The John Updike Society Links my Last Two Pieces on Updike and DFW!!! I'm so pleased to have had my most recent piece on John Updike and David Foster Wallace--not to mention my previous piece on these two authors--linked by The John Updike Society, which operates for the purpose of awakening and sustaining reader interest in the literature and life of John Updike, promoting literature written by Updike, and fostering and encouraging critical responses to Updike’s literary works. Updike and Wallace are two writers whose lives and works become only more relevant to me as time goes by. They and their characters deal with equally compelling takes on consumerist culture, Updike's in love with what such a system grants us, Wallace's painfully aware of the underbelly of such a system. Big thanks to Cigale Literary Magazine and Word Riot for publishing these pieces. I loved writing both.